Practice is rarely a person’s favorite aspect to anything that people do. Yet, without practice, it is hard to do anything well. 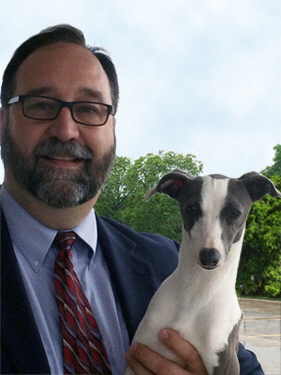 Occasionally we get that Italian Greyhound who loves to show and does so without much practice. Most take some time in the ring either through early entries, conformation classes, or just time on the sidewalks of the neighborhood. For me getting practice at movement was something we could do while going for a walk so it was accomplished easily enough. Practice on the table was something I have not liked to do and consequently, getting my dogs to stack well on the table has sometimes been a problem. While at the show I took one good look and then doing some measurements of our grooming table once we got home and an hour later I had my own stacking box built. I think the design is perfect and allows for great adjustment. 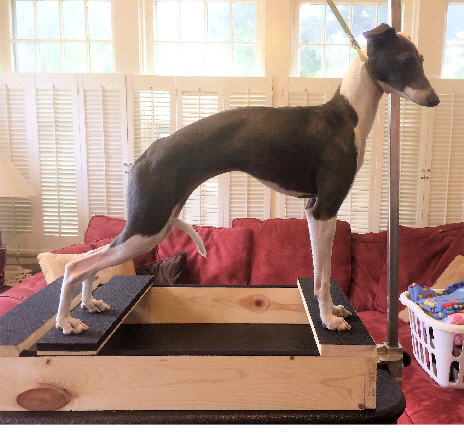 The box is extremely stable and does not allow the dog you are working with to pull its rear legs up under itself and you can move the stance out with practice. The dog is more comfortable with the stability of the box. The down side compared to stacking blocks is that it is not as restrictive on lateral movement, so there is a tradeoff but I think it is worth it. 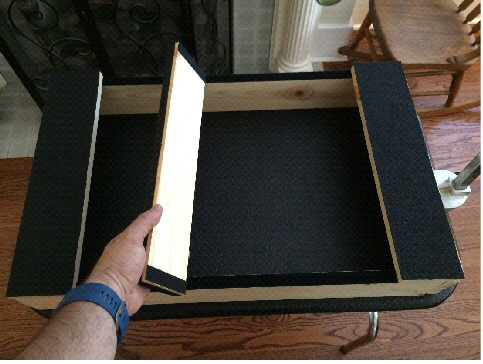 I’ll end the article with instructions on how to build your own stacking box but before that let me share some ideas on using the box with your puppy. I hope you will notice how much more confidant Echo, Skidi’s Hear You Sing Again, looks in the final picture than she did when we first started training. It is hard enough to get a young pup to stand still on the table and be indifferent about the judge (neither scared nor get too excited about a potential new friend) but when you don’t practice it seems almost impossible. Add to this, trying to start two pups at once and a weekend of shows can be more than frustrating. This is kind of where I was recently. That is until Angie showed me a stacking box at a recent show. I had seen puppies on stacking blocks where they looked like scared puppies on stilts. I wasn’t interested in doing that so the box intrigued me. Once you have built your box, you will start training your pup. You have two objectives to your training. First, is to get your dog comfortable being on the table and second is building muscle memory on the proper stacked position for your pup. The box is very stable so putting your pup on it is not much more intimidating than using your regular table. Still, you will want to start out putting you puppy on the box for short periods of time, maybe 30 seconds to one minute. You will adjust the middle stand on the Velcro strips to suit your dog’s length and put you puppy on the box for short periods of time as you start. Be sure to reward your puppy for doing a good job on the table. After a couple of short periods on the box the first day stop. Each day increase the time you spend working with your pup on the box until you are spending longer periods of time on the table each day and you begin to see your puppy step into the proper stacked position on their own. This helps their feet know how you want them to stand. Remember not to leave your dog on the table unattended. You will put the four sides together first using the two 24” boards and 2 16” boards. Your box should be 16” wide and just over 25” long. You need to predrill two hole with a drill bit smaller than your screws to attach each corner. After drilling apply glue to the inside of the joint then install the screws. Repeat for each corner remembering to place the ends so they lengthen the sides. Once your four sides are in place, creating your box, you will install the two top end rails which are used for stacking. 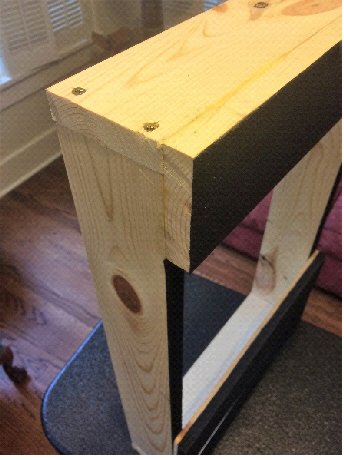 Start at either end by placing one of the 16” boards on top of the frame box end. It should cover the end and several inches of the side rails. While holding it in place drill two holes through the top and into the side rails and four hole along the edge and into the end piece. Line the inside with wood glue and screw in 8 woodscrews holding the boards in place. Now repeat at the other end. 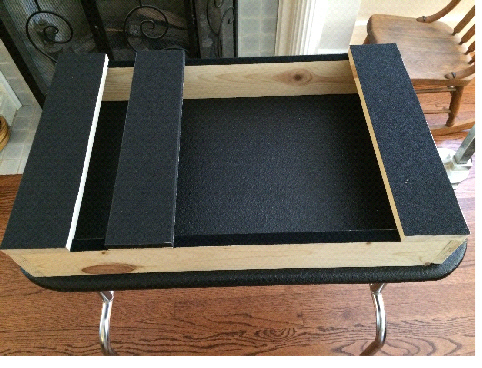 Now you should have your box and one 16” piece of board which will be used as the mobile rail for you pup’s back feet. You will now cut your grip tape to fit each of the three 16” boards used for positioning your puppy. As you cut each one you will peal the back of the tape and apply it to the board. Do this with each board. Next you will measure the Velcro to apply to the top of the side rails between the two surface rails on the ends of your box. Cut to the appropriate length (roughly 15”), peal the backing and apply to the rail of equal width on top of each side. Finally, cut two lengths of the opposing Velcro strips to fit on to the bottom edges of the mobile top rail (just under 4” each), peal the backing and apply on the opposite side of the grip tape. 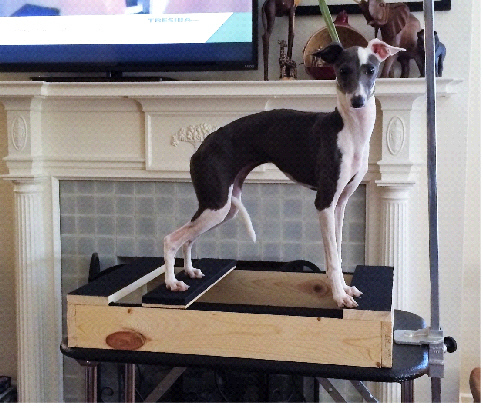 If my instructions have been clear enough you should have your very own Stacking Box for your Italian Greyhound that will fit on top of you grooming table. 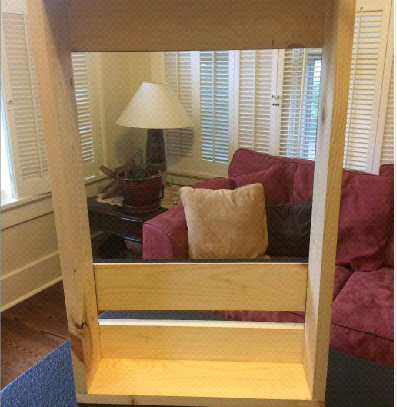 The proportions could be adjusted to narrow or lengthen your own custom box for a larger breed or your personal desires. Echo and I wish you much success in building your own box, your practice, and how you do at the shows.